I’ve partnered with Tillamook to bring you this delicious recipe, but all opions are my own. Thank you for supporting The Daley Plate. Each of us three girls had our favorites when we were growing up in South Africa. For me, it was mom’s lasagna (because cheese). My youngest sister found comfort in ketchup on plain white rice (weird) and my sister Aretha’s favorite was cheesy cheddar samosas with onion. It’s a classic combination in South Africa and can be bought at your favorite corner store, but the best of them are made by home cooks who specialize in party food. We always had a variety of samosas in the freezer to bake or fry at any time...A variety of cheddar with onion, curried beef or chicken to enjoy with unexpected guests or during Sunday afternoon soccer games on television. Tailgating season is upon us and somehow it sparked a craving for nostalgic comfort foods. A lot of you are aware that cheese is my forever love, and that’s why I jumped at the chance to make these Sharp Cheddar, Squash and Onion Foldovers for Tillamook. Inspired by my sister’s favorite samosas, made easier and faster using ingredients readily available at your supermarket. For this recipe I used the 9-month, naturally-aged Tillamook Farmstyle Cut Sharp Cheddar Shredded Cheese which in my opinion is the perfect choice in terms of flavor, meltability and just look at the size of them! They are grated from 40 lb. blocks of award-winning, Tillamook Cheddar and you really get that somehow tastier, hand-grated texture. I love using them combined with the diced shallot, red onion, roasted squash and chives here - All it took was a quick toss and everything was evenly distributed. Tillamook is a brand that I have loved since discovering them, and their Farmstyle Cut Shredded Cheese really sets the bar for quality shredded cheese available on the market these days. They have a handy “Where to Buy” tool on their website so you can which store has them in stock closest to you, you’ll be glad you did! Tip: Repurpose any roasted vegetable leftovers by adding them diced to the cheese mixture. Chard, mushrooms, pumpkin or other Fall vegetables will bulk these foldovers up to be satisfying enough for a light meal. Serve them with this peach chutney, or any other spicy fruit chutney - The flavors work so well together that I can’t eat them without it! Warmer spices like clove, cinnamon and allspice aren’t ones that many people would normally consider eating with cheddar but it totally works and I hope you try it. 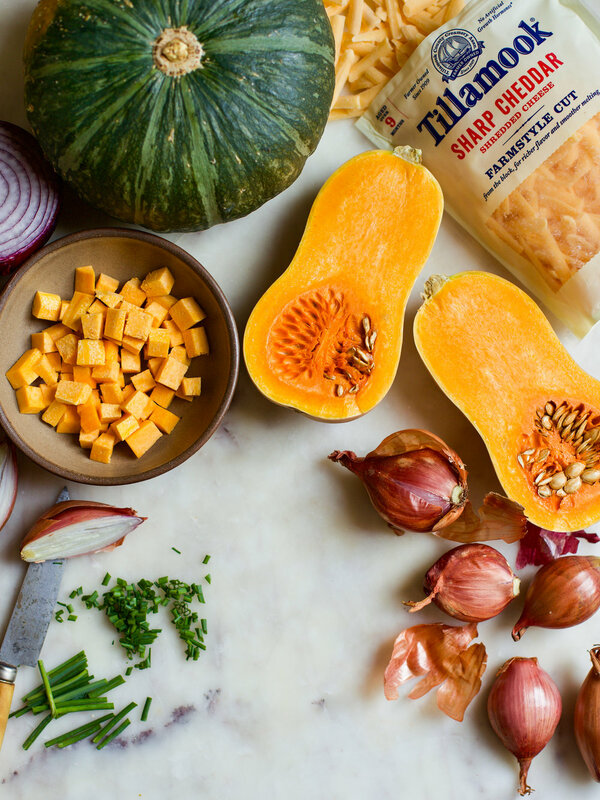 Gently toss Tillamook Shreds, squash, shallot, red onion, chives and black pepper in a medium bowl until ingredients are evenly distributed. Place individual wonton wrappers on a flat surface or baking sheet and spoon 2 oz of the cheese mixture in the middle of each. Brush the edges with the beaten egg using a pastry brush, gently fold one end of the wonton wrapper over and seal with your fingers making sure to release any air bubbles trapped inside. Repeat this process until all of the cheese mixture has been used. Make a ⅛ -inch incision on the top of each uncooked foldover for air to escape during the baking process. You can also use kitchen scissors to make a quick snip at the top. This will prevent steam from causing the foldovers to burst. Place foldovers on a baking sheet and spray lightly with olive oil spray. Bake for 10 minutes until crispy and golden. Serve immediately for maximum melty cheese happiness! Tip: These freeze very well and can be baked as needed. When baking from frozen, simply preheat your oven to 400F and bake for 10-12 minutes until golden. Though many versions of this dish exist, beef or chicken samoosas filled with traditional spices are most popular in the Cape Malay communities of South Africa. They are served at parties or anywhere that people gather, and often with peach chutney. The sweetness of the chutney paired with crispy spiced beef parcels keep people coming for more. You can buy South African chutney online now, as well as most of the spices used. Traditionally, pur or readymade Indian pastry is used. Pur is a common item at any Indian grocery store, but I could only find phyllo pastry where I live. Both work wonderfully. I remember my mom frying samoosas last December when I visited home for the first time in eight years. Making them in large batches (necessary during holiday season) is time consuming, so she had ordered 250 premade but unfinished from a lady who is well-known for her samoosas. Every town has that Aunty - One who has perfected the art of samoosas, savory pies or smaller confections like lamingtons. Those aunties are a godsend for people like my mom who work full-time. If you do not order by November, you can forget about it because they are that popular. The fragrant aroma of coriander and leaf masala filling our house during the holidays is always magical. Mom knew how much I had missed samoosas while living here in the states, and 250 seems like a lot, but we enjoyed them so much almost every day. If only I could've brought some back with me! Heat the olive oil in a large skillet over medium heat and add ground sirloin until browned, about 5 minutes. Add the onion, garlic and spices and sauté until onions are golden and soft. Finish the filling by adding coriander, sugar, salt and lemon juice. Stir and remove from heat - Allow to cool. Can be made ahead of time, stored in the fridge and assembled later. Place phyllo on a clean, dry surface and use a sharp knife to divide phyllo rectangle into three parts lengthways. You should have three equal long stacks of pastry. Take one at a time and cover the remaining sheets with a clean damp kitchen towel so that they don't dry out. Lay the phyllo strip on a work surface and add a tablespoonful of filling to the top corner, then fold the filled pastry across to close the open side. Keep folding from one edge to the other, keeping the triangular shape and making sure the corners are tight, until you're left with a lip. Brush it with the beaten egg and secure. Alternatively you could make a slurry of 1 tablespoon cake flour and 2 tablespoons water to do this. If you prefer, you could also just cut this portion off. Set finished samoosa aside on a baking sheet covered with a clean damp kitchen towel and repeat this process with all phyllo pastry sheets. Makes 30 - These freeze very well in an airtight container and then you can bake it off later. Spray with olive oil spray and bake for 8 minutes or until pastry is golden. Serve immediately.